So your friends have told you repeatedly to buy a Miata already, but you can't get over the old cute-car stigma. Or perhaps you don't want a shuddery convertible, and don't look forward to paying an extra $1k for a Miata hardtop to make it more of a real car. Great news! For about the same price as a tatty NA Miata, you could have a sweet-looking, survivor-grade AW11 MR2. Find this 1986 Toyota MR2 for sale in San Diego, CA for $2,500 via craigslist. 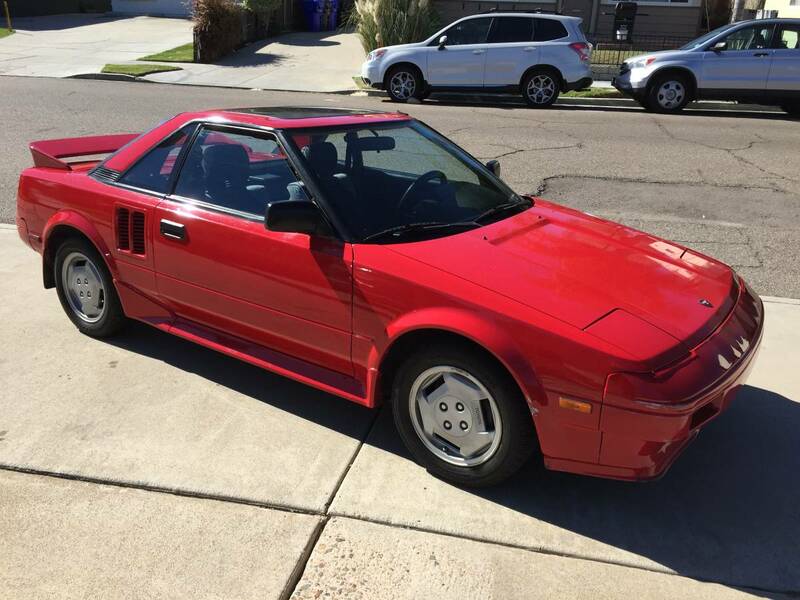 I don't care what it is - any decent Japanese car from 1986 in this kind of condition is worth at least $2,500 - all day long. The fact that this one happens to be the mid-engined sporty MR2 is a huge bonus. These cars haven't appreciated like the faster Japanese cars from the '70s - '90s; they have stayed at bargain basement prices similar to the Miata. 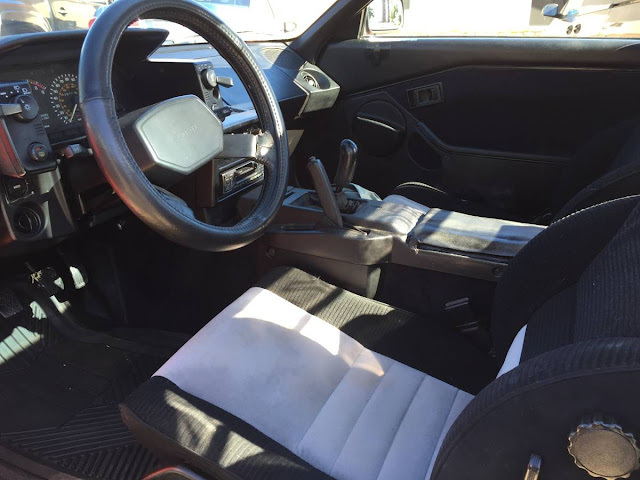 You'll get about the same interior volume as a Miata, with two bolstered seats, a high tunnel, a 5-speed manual, and direct steering. 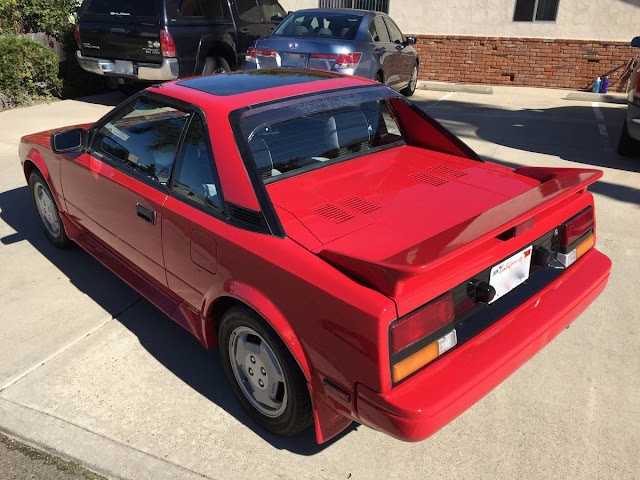 In an MR2 you have a real roof over your head, albeit sometimes with T-tops, and sometimes with sunroof like this example. Regardless, the presence of real C-pillars means that torsional rigidity is an integer number and rollover safety is something you can think about. The driving experience won't be as delicately perfect and controllable as a Miata; suspension design is a bit archaic and the AW11 is heavy for its size. But you'll have a sweet revving 4AG-E 16-valve four sitting behind your head, and those great chunky origami wheels...and a car that will spark up conversations at gas stations and be livable as a commuter (it has two trunks!). CFlo is Daily Turismo's Technical Editor and co-founder. When he's not pushing around his dead chain driven AW11 with the blown-up Kawasaki sportbike engine, he's piloting a V8 E36 around a race track, or driving a Volvo 240 to work. Learn me something, CFlo. What constitutes archaic suspension design? My first true sports car. Mine was also an '86, purchased used in 1990, and traded in '94 for a gently used '91 Miata. My impression was of insanely short highway gearing: 4000+ revs in fifth just to keep up with traffic. A rather fragile gearbox linkage, mine would pop out of fifth on trailing throttle at 120k+ mileage. (Worn engine/transmission mounts?) Also, ran through brake pads at a rate not really seen on modern cars. But, having said all that, it had amazing steering feedback; superior to the unassisted rack in the NA Miata, and the 4AGE was noticeably smoother than the BP series 4 in the Miata, while producing similar power. CFlo's right in the relative difference in the two's handling balance, though, the Miata was the more forgiving of the two, while Mr. Two was a bit rawer, but more fun when done correctly. (Just remember to check your shorts for unintentional fudge afterwards.) Loved, and still miss, the suprising amount of storage space in the two trunks, and a pretty decent amount of in-cabin storage, as well. A good little daily driver, if one remembers to watch corner-entry speeds on wet pavement: no weight over the steers means terminal understeer, and snap oversteer exiting that same corner. MR2 had 4-wheel struts with wonky multi-piece lower arms at front, and trailing arms at rear. Pretty heavy compared to the Miata; precision and camber curves suffer too. Not to say the MR2 had oxcart axles or something, just that the Miata was more elegant in that regard.